Providing you the best range of bagging machine, jumbo bagging machine, bulk bagging machine, bagging system and semi automatic bagging machine with effective & timely delivery. The Bagging machine is a compact semi-automatic packaging system. 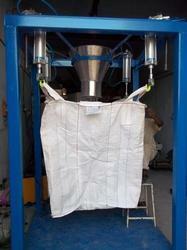 Its design permits the bagging of powders and granules into preformed open-mouth bags. 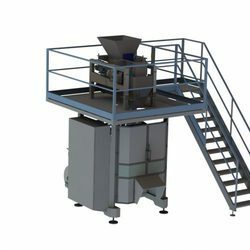 The Bagging Machine is specially studied to facilitate an easy cleaning. The bag spout is featured to allow its simple and quick change with regard to the different bag sizes. The integrated operator panel of ultimate generation permits an easy and friendly acknowledge of the process configuration and diagnostics. The operator presence having the scope to minimize dead time and optimize the operator's functions. The optimized design and simple clean down procedures make the ideal for the feed and food industries. The system flexibility and the performance of the machine allow being integrated into other industrial sectors. As an option, the machine can be implemented. 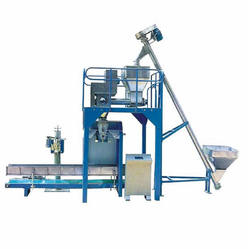 Manual bagging machine available with different feeding systems: gravity, belt, auger, etc. both for "Net weight" and "Gross weight". Being the leading names in the industry we are involved in offering a wide range of Jumbo Bagging Machine. These are made using the best raw materials available in the market to render maximum client satisfaction. Offered products are stringently tested on various parameters by our quality controllers before they are dispatched. Moreover, if required these are integrated with inflation fan and dust extraction system of best quality. 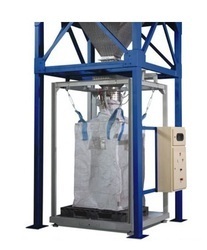 Our Bulk Bagging Machine designed to accept various products, allowing users more flexibility to utilize the system to bag a broader range of materials. Standard systems include a hopper with the capacity to hold of material, belt conveyor, and filling frame. The channeled arms on the bag filling frame are designed to accept sleeved bulk. Once filled the bag can be removed with ease by using a conveyor with stitching. The Bagging System is a compact semi-automatic packaging system. Its design permits the bagging of powders and granules into preformed open-mouth bags. 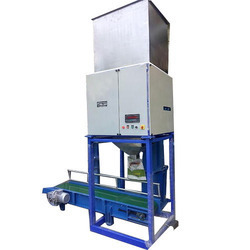 The Bagging Machine is specially studied to facilitate an easy cleaning. The bag spout is featured to allow its simple and quick change with regard to the different bag sizes. The integrated operator panel of ultimate generation permits an easy and friendly acknowledge of the process configuration and diagnostics. The operator presence having the scope to minimize dead time and optimize the operator's functions. We manufacture and supply to our precious clients with quality-assured Semi Automatic Bagging Machine for Pulse, Rice, Grains. 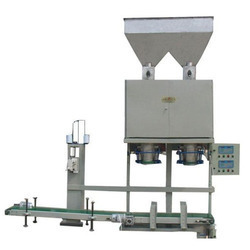 This Semi Automatic Bagging Machine For Grains are offered by are built with precision and quality-tested, which makes them suitable for use in diverse industries. Our offerings are known for providing reliable performance and accurate results. We offer this machinery in tamper proof packing to ensure that our offering reaches our client's damage free. With the Machine with the assistance of our diligent professionals, we have been able to provide a wide range of Jumbo Bagging Machine to the customers. We designed this machine as per the specifications laid by our professionals. Ultra-grade raw material sourced from the leading vendors is used in order to design this product. It is highly demanded in the market and offered to the clients at market leading price range.